Tanner Clark sits by a heater at home on Tuesday April 12, 2016, during one of his many flare-ups of his rare skin condition that causes his skin to burn for days after coming in contact with water. One side effect is that he always feels cold, even with heaters going and the temperature set to 85 degrees. During flare-ups Tanner has to stay home from school, and any contact with anything causes his skin to burn, so he spends his time in mesh chairs and hammocks with as little surface area as possible. Mike Rogers takes photos of the damage to his house and his RV Friday morning in Freedom Hills East of Gillette. A storm passed over the area at about 8 p.m. Sunday evening and lifted the 12,000 pound trailer off the ground and threw it into the home. Wearing a Bernie Sanders pin JJ Onkka, 3, plays on his mothers phone during the Campbell County caucus on Saturday morning. JJ's mother Ashley supported Sanders during the caucus citing "All of his policies," she said, specifically his plans for making college tuition free and healthcare for all. "It's just amazing that someone has made it this far with that platform," she said. Sanders won 12 delegates in Campbell County, while Hillary Clinton was awarded six. An employee with Salt Lake City based Brimley Neon works to install signage on the Frontier Auto Museum Tuesday, on the corner of West Second Street and Ross Avenue. The museum featuring regional gasoline and automotive industry relics, founded by L&H Industrial Vice President Jeff Wandler, opens to the public Friday at 10 a.m.
16-year-old Austin Borrego runs back across the bridge at Gillette College after finishing the Razor City Runners New Years Eve race, to finish the 5k with his friend Brett Dally. Joel Lindberg with Wind Creek Services prepares to install a 20 foot tall post on East Third Street in downtown Gillette on Wednesday afternoon. Some community members have objected to the location of the post, part of the city's 3rd Street upgrade project, as it will block part of Harvey Jackson's 1999 mural. Laura Chapman works to prime the wall on the side of Rapscalliions Barbershop on the Third Street Plaza where a new mural will cover the cowboy mural Harvey Jackson painted in 1999. The new mural will be painted by Pat McGirr under the direction of AVA Community Art Center instructor Sarah Ferguson, and will feature various small portions painted by local kids. Thayne Arnoldi stands in his bedroom at Second Chance Ministries on Wednesday morning. Arnoldi is the first resident to move into the organization's new 11-bed living space. Deputy Director Jeannie Miller says housing is one of the biggest keys to success for folks returning from incarceration, and "to be able to finally meet (that need) is huge." Members of the combined sixth grade string orchestra, from 12 local elementary schools, perform Tuesday evening at the Campbell County School District Strings Gala at the Cam-plex Heritage Center. The gala featured students from sixth grade through high school as well as additional accompaniments by teachers and staff. Kain Sherman, left, and Gavin Sidener fish through a hole in the ice on the Gillette Fishing Lake at Dalbey Memorial Park. Kristy Oshiro, an 8-year veteran with New York City based Taikoza, performs Monday at Hillcrest Elementary School. The group, specializing in Japanese Taiko drumming is visiting various schools around Campbell County this week before a public performance at 7 p.m. Wednesday at the Heritage Center Theater. Kara Felmlee demonstrates a move to her Ballet Level 1 & 2 class Tuesday evening at Backward and in Heels dance studio. Felmlee has been teaching the class since the program started in August. Misteen English, right, playing Jane Banks watches Anna Capron, center, and AnneMarie Gutierrez, Miss Andrew and Marry Poppins, during the final rehearsal for Campbell County High School's production of Mary Poppins, which opens Thursday night. Johnathan Peel, 10, catches air while sledding Saturday at Sage Valley Junior High. Chelsea Roan protests refugee resettlement outside the Campbell County Courthouse in Gillette on Wednesday. “What they don’t understand is that those people (Muslims) want to kill you. They want you to die,” she said of a nearby group of counter-protesters. Protest organizer Bret Colvin hangs a Gadsden flag over the railing in front of the courthouse Wednesday afternoon. Colvin organized the rally to voice opposition for, among other things, refugee resettlement in Wyoming. Campbell County Firefighters work to put out a fire in a garage on Nathan Hale Road. At this time the department has not determined the cause, but the garage and a neighboring RV were both burned. Lakeview principal Dale Petersen rides Zeke Williams's new bike down the hallway on December 22. The bike was donated to Williams by the YES House who worked with local businesses to give away 74 new bikes to children around Gillette. Campbell County High School football player Caleb Durgin carries an armful of instant ramen into the Council of Community Services Wednesday afternoon. Durgin is one of 5 CCHS football players helping to collect food for the council. Jim Berman, dressed as Elvis, walks up the stairs at the Heritage Center Theater Saturday evening after playing a song in the Gillette's Got Talent competition. Patty Case tends to her animals on her farm outside of Rozet Monday afternoon where she raises cows and a variety of miniature animals including horses, donkeys, cows and sheep. Case joined the Take Off Pounds Sensibly (TOPS) group in Gillette when she realized she was having difficulty with basic tasks on her farm. Mario Coppe of O'Neil Company directs the truck carrying the 100-year-old house that sat at 604 S. Gillette Avenue onto the road Thursday morning as the truck makes its way to its new home near the Heppner Ranch north of Rozet. Just before the house was set to be demolished, Mike Cote contacted owner Christie Williams and offered to move it to his ranch, where he will restore it to its original condition. Kiara, a 4-year-old Miniature American Shepherd, exercises on a treadmill on February 4 in the basement of owner Jerisha Ganske's home on Highway 50. Ganske and Kiara are preparing to go to New York City this week to compete in the Westminster Kennel Club Dog Show. Lara Skelley works to harness her horses Tuesday afternoon at McCreery Ranch. Skelley is training for the annual chariot racing takes place Saturday and Sunday starting at noon. Lara Skelley drives her horses Tuesday afternoon as she trains for a chariot racing event at McCreery Ranch. Chariot racing takes place Saturday and Sunday starting at noon. One of three rotating Hairball singers, dressed as Paul Stanley from KISS, throws a guitar pick into the crowd Friday night at the Cam-plex Wyoming Center. Hairball, performing for over 15 years, returned to Gillette for their third time Friday. Trish Thompson gives a pep talk to her son Schuyler Pena, 4, before his wrestling match at the Wild West wrestling tournament Saturday at Cam-plex. Gillette seniors Lauren Hallcroft and Jessie Geer hug after winning the 4A state basketball title, beating Natrona County 84-62, Saturday afternoon at the Casper Events Center in Casper. Sage Valley seventh graders Kameron Engle, left, and Wyatt Titus play a game of one-on-one basketball at Sage Bluffs Park on Wednesday afternoon. The pair has spent their spring break so far playing sports and watching movies, "We saw 'Batman v Superman' last night," said Kameron, "we've just been playing football and basketball." Spencer Garcia looks for work through an online job search website while his newborn daughter Devyn sleeps beside him. Garcia was laid off from a temp job as a haul truck driver at North Rochelle Antelope Mine, his last day of work came about a month after signing a 12-month lease for an apartment and just days after the birth of his daughter. "It hit me hard when I first got the news," said Spencer, "(Kayla) was pregnant, I had just signed the lease. I was pretty sour about it"
Matt Johnson sits in the waiting room at the Wyoming Department of Workforce Services Thursday afternoon after finding out he had been laid off from his job with Big Horn Tire working at Black Thunder Mine. "I've grown up oil field" he said, hoping that he could find a job in his old industry, "I could go back to waiting tables at a restaurant I suppose, there's not a foreseeable answer for this, it's gonna be bad for the whole community." Kinsley Switzer, 14, and her brother Harlen Serrano, 5, listen to Cloud Peak Energy's Luke Malyurek read a book during Eat, Read, Grow Tuesday night at Wagonwheel Elementary School. Eat, Read, Grow is a program rotating around different schools where volunteers visit with kids, read to them, and the kids and get to take home a new book and a bag of groceries. Gillette Dodgers shortstop Gage Gouldy looks out from the dugout Thursday evening during a game against Newcastle at Bicentennial Park. Gillette Babe Ruth baseball is celebrating 50 years this spring. Gillette's Lydia Foster leads a group prayer before the 1600-meter run Saturday at the state track championships at Kelly Walsh High School in Casper. 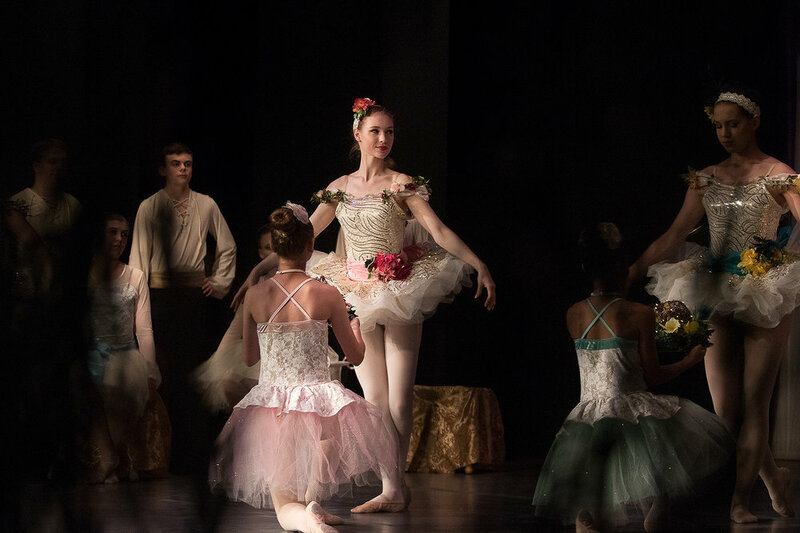 Claire Thomas as the Fairy of the Crystal Fountain performs during dress rehearsal for the Dance Arts Gillette performance of the classical 19th century ballet Sleeping Beauty. A young runner crests one of the many hills on the course at the Buffalo Stampede 5K/10K on Saturday morning at the Durham Buffalo Ranch just north of Wright. Cord Herring, left, practices roping in the Cam-plex parking lot while Cade Herring looks on Saturday morning during the Wyoming high school rodeo finals. Miss Maryland, Jessica McKnew, rides her horse behind the arena at Morningside Park on Saturday morning. Eva Geffre, 5, sits in the bucket of a front loader during family day at the Wyodak mine on Tuesday, July 26, 2016. "This is awesome," her mother Cammi Geffre said, "It's better than a birthday party!" Campbell County Firefighters work to put out a blaze that destroyed a building at Curry Garage Door on Southern Drive Tuesday evening. Mohammad Kahn, 22, addresses the crowd at a rally against hate and discrimination Saturday afternoon at Cam-plex Park. The rally was a response to an anti-Islam rally happening in another park of the park. "What makes America great is Diversity," Kahn said, "America is not the land of the fearful, it's the land of the brave." Hayden Chambers, 10, fires the deck gun on Engine 11 outside Conestoga Elementary School on Monday morning. The Chamberses lost a family member in the Sept. 11, 2001 attacks in New York, and every year the brothers write a thank you note to local firefighters. This year the firefighters gave the boys a ride to school on the engine Monday morning. Don's supermarket employee Sandra Brady, and mother-in-law of owner Trow McKeown, works to sort through damaged product Monday afternoon after heavy rains cause the roof to leak and the store to flood. McKeown hopes to have the store opened back up on Thursday. Students in John Bayles's American government class at Campbell County High School discuss the upcoming presidential election during class at North Campus on Monday afternoon. Senior Jacob, right, the only eligible voter in the class, and still undecided, has considered skipping the presidential vote altogether. Former Gillette mayor Edd Collins reads election day coverage in the Casper Star Tribune at 8:30 a.m. on Wednesday morning at Brother's Coffee on Gillette Avenue. "I feel good, revitalized," he said, "I was scared because of what Hillary would do to our economy in Gillette." He added he was excited about Liz Cheney's win in the US House of Representitives, "We're really proud she got in and she'll serve us well" he said. 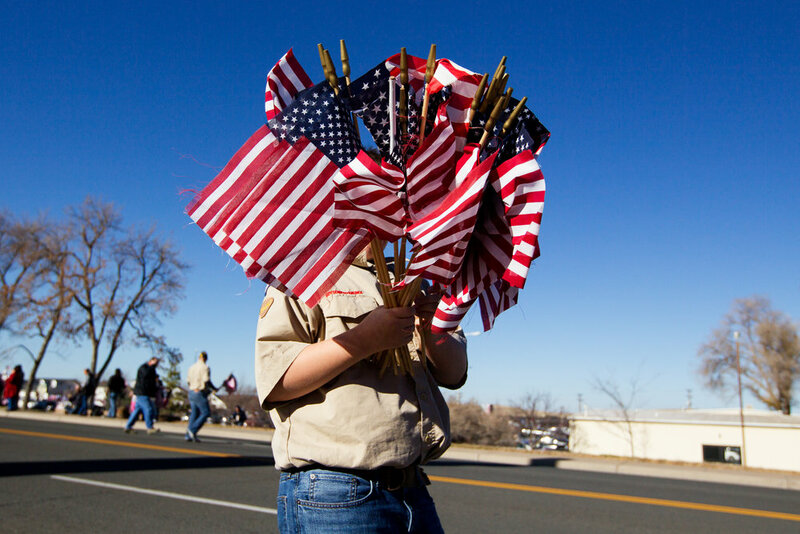 Duncan Davidson, 12, carries a handful of flags while passing them out to bystanders before the Veteran's Day parade on Friday afternoon in downtown Gillette. Girls throw candy from the Miss Campbell County entry during the Veteran's Day parade in downtown Gillette on Friday afternoon. Lucas Strawn pulls his 4-year-old son Logan behind him as he snow blows the parking lot of his mom's office on Monday afternoon. According to the National Weather Service Gillette got 2 inches of snow on Monday, and should expect clear skies and temperatures below freezing for the west of the week, with more snow possible Friday night. Gillette police officer Alex Rozier eats breakfast with Dayan Noyola, 6, at Paintbrush Elementary before the annual Shop with a Cop event on Saturday morning. The event brought together 50 kids and about 45 law enforcement officers for breakfast and then a shopping spree at Kmart where each child was given $160 to buy what they wished, including clothes and toys. Tarena Deminch measures the bed of the 1970s pickup truck that the group Students That Care is restoring at Rod Iron Custom Fabrication on Wednesday night. Gillette's Deric Johnson wrestles with Natrona's Yahav Schraiber during the Camels duel with the Mustangs on Thursday night at Campbell County High School North Campus. Diann Murdock's hands are reflected in the screen of her laptop as she records a song in her apartment at Primrose Retirement Community on Friday afternoon. Murdock has been recording herself playing the piano and plans to leave behind a catalogue of music for her family when she dies. Derek Wilson clears the driveways outside of Quick Lube USA on Lakeway Drive Tuesday morning. As of 8 a.m. Tuesday there had been 2 inches of snowfall in Gillette, with 1-2 more inches expected throughout the day, said Shane Eagan, meteorologist for the National Weather Service in Rapid City. Bruce Fredrick leaves the Heptner Cancer Center at the Campbell County Memorial Hospital on Wednesday afternoon. Fredrick lives in Aladdin and travels to Gillette five days a week for cancer treatments. A common roadblock for patients in rural areas is travel, says Kim Nelson, the Wyoming Cancer Resource Services coordinator of northeast Wyoming, who is working with the American Cancer Society to implement their Road to Recovery program here in Gillette.